Halo Custom Edition Halo CE says "Manual Update Required"
The one and only update to the Halo CE game was released on May 25 2005 as a manual update that brought the game engine up to version 1.07. It was a security update that corrected deficiencies in the GameSpy protocol implementation. Since the Halo CE game is unsupported the Hot-Fix was released as a manual update to be distributed via the Fan websites. Being the largest and most stable, Gearbox requested that Halo Maps distribute the patch. At that time Bungie updated the message of the day ticker to indicate that a manual update was required. (See picture). After some discussion Gearbox persuaded Bungie to make the update mandatory by utilizing the automatic update mechanism built into the game. Each time you connect to the Internet to play the Game will "Check for Updates". An Un-patched game will then force a download and not let you play on the internet until the update is completed. 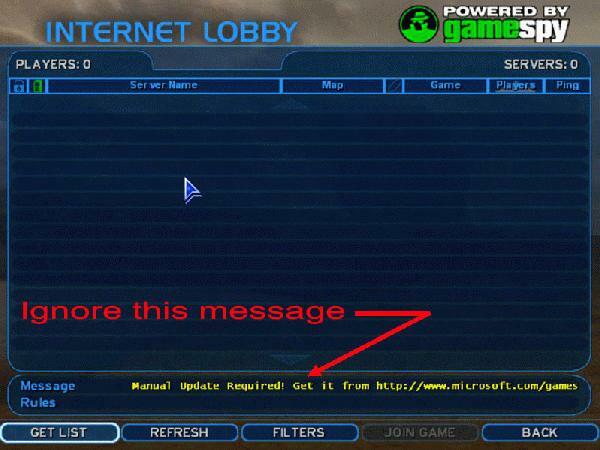 If you have already updated your Halo CE game and installed the 1.07 Hot-fix then you can ignore the scrolling ticker message (see picture) that displays in the internet Lobby. It is left over from before the update was made mandatory.